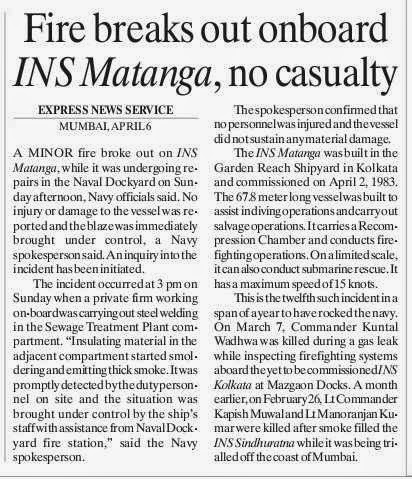 A fire broke out today on board naval ship Matanga which was undergoing repairs at the dockyard here but no casualty was reported in the incident. This is the 14th mishap involving a naval vessel in the last 10 months, including INS Sindhurakshak submarine which sank at the Mumbai harbour on August 18, last year, killing 18 personnel on board. The fire broke out onboard INS Matanga, an ocean-going tug capable of towing two large vessels out of the harbour, during welding on the ship, Navy officials said. Fire tenders were rushed to douse the flames and the extent of damage caused to the ship was being assessed, they said. No casualty took place in the incident and a Board of Inquiry has been ordered to investigate it, the officials said. 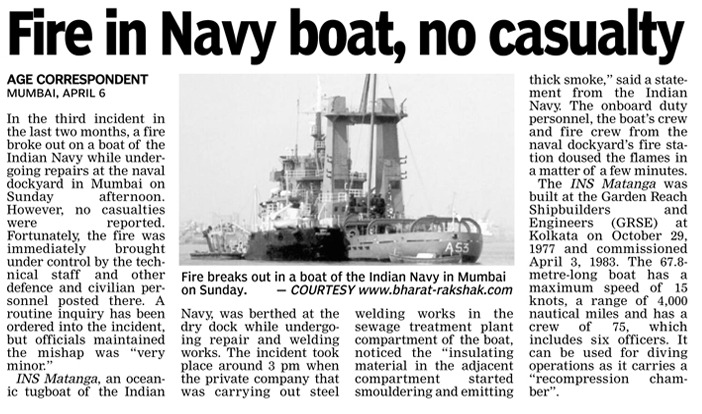 "Around 3 pm today, there was a minor incident of smouldering and smoke observed on board Indian Naval Ship Matanga which is undergoing repairs at Naval Dockyard, Mumbai. A Board of Inquiry has been ordered to investigate it, officials said. 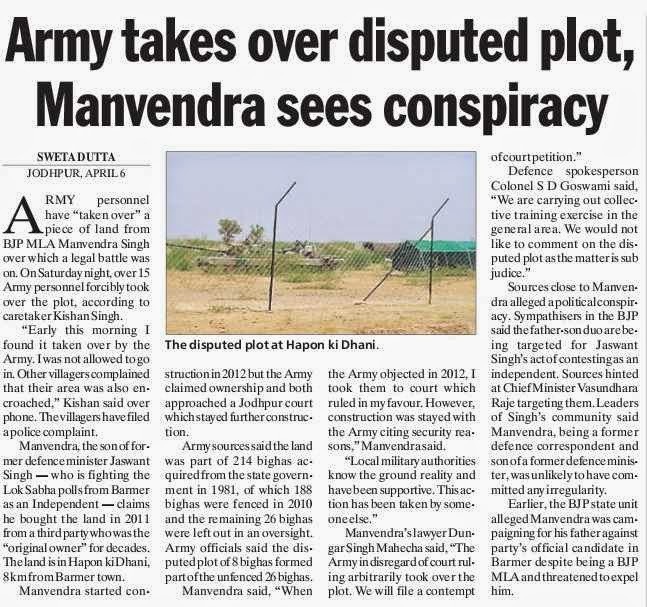 Army personnel have “taken over” a piece of land from BJP MLA Manvendra Singh over which a legal battle was on. On Saturday night, over 15 Army personnel forcibly took over the plot, according to caretaker Kishan Singh. “Early this morning I found it taken over by the Army. I was not allowed to go in. Other villagers complained that their area was also encroached,” Kishan said over phone. The villagers have filed a police complaint. Manvendra, the son of former defence minister Jaswant Singh — who is fighting the Lok Sabha polls from Barmer as an Independent — claims he bought the land in 2011 from a third party who was the “original owner” for decades. The land is in Hapon ki Dhani, 8 km from Barmer town. Manvendra started construction in 2012 but the Army claimed ownership and both approached a Jodhpur court which stayed further construction. Army sources said the land was part of 214 bighas acquired from the state government in 1981, of which 188 bighas were fenced in 2010 and the remaining 26 bighas were left out in an oversight. Army officials said the disputed plot of 8 bighas formed part of the unfenced 26 bighas. 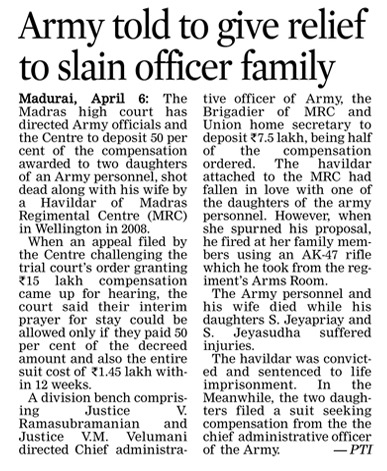 Manvendra said, “When the Army objected in 2012, I took them to court which ruled in my favour. However, construction was stayed with the Army citing security reasons,” Manvendra said. Sources close to Manvendra alleged a political conspiracy. Sympathisers in the BJP said the father-son duo are being targeted for Jaswant Singh’s act of contesting as an independent. Sources hinted at Chief Minister Vasundhara Raje targeting them. Leaders of Singh’s community said Manvendra, being a former defence correspondent and son of a former defence minister, was unlikely to have committed any irregularity. Earlier, the BJP state unit alleged Manvendra was campaigning for his father against party’s official candidate in Barmer despite being a BJP MLA and threatened to expel him. A senior BNP leader has said India may deploy army in Bangladesh in the name of guarding its power corridor. Standing Committee member Gayeshwar Chandra Roy made the insinuation on Sunday while speaking at a human chain. Roy said the power transmission lines that will link north-eastern and north-western parts of India through Bangladesh will waste 4,500 bighas of land. 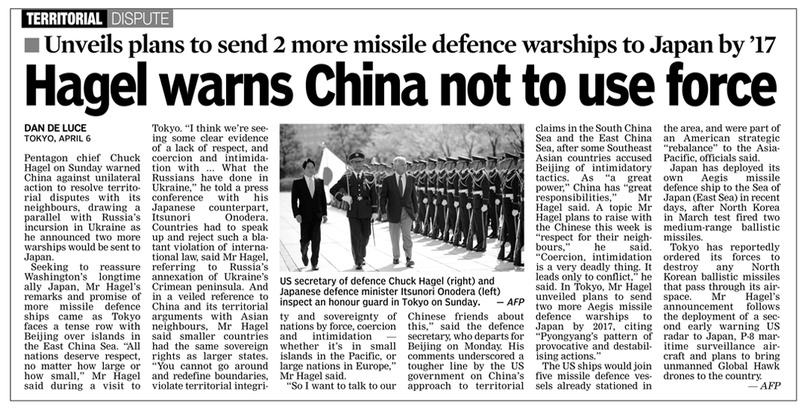 “Then India will say their infrastructures need to be protected by their own forces. This way they will take away our independence,” he said. Roy once again repeated the BNP’s claim that the party’s founder Ziaur Rahman was the first president of Bangladesh. Roy accused the government of corruption in issuing awards to foreigners for their contributions in the Liberation War. “Those gold medals have very little gold in them. The ruling party has pocketed money even when making Liberation War medals,” he said. BNP Vice Chairman Abdullah Al Noman demanded reelection in the Upazilas, claiming that there had been widespread corruption in the recent elections. Given the hyperbole surrounding the jealously guarded Henderson Brooks Report (HBR), its disclosure, far from being a “grand denouement”, has turned out to be somewhat anti-climactic. Complex cartographic nuances of the Sino-Indian border and the ineptness of India’s political and military leadership in 1962, brought out by HBR, will provide material for endless academic discussion and analysis. However, there are other lessons to be learnt from this episode, especially since not much seems to have changed in the half-century that has elapsed. For example, an April 2013 issue of the Economist identified three impediments which, according to the magazine, had thwarted “India’s ambition of becoming a 21st century power”. These were: the absence of a strategic culture, the distrust between a civilian ministry of defence (MoD) and the armed forces, and a dysfunctional defence procurement system. This shrewd observation by a foreign journal is close to the mark and all three factors deserve attention. While “strategic culture” may be a vast and arcane subject, the manifestations of its absence are as pedantic as they are damaging. For example, nothing illustrates the complete indifference of India’s political establishment towards crucial national security issues better than its failure to appoint a new Naval chief for over a month — clearly an egregious dereliction of responsibility! Another significant pointer is the politician’s profound disinterest in, and ignorance about defence, security and strategic affairs, as well as the military ethos. The latter has led to the emergence of a thorny and, often, mutually suspicious relationship with the senior military leadership. This uncomfortable politico-military equation has been exploited by certain agencies to plant suspicion — through a pliant media — about the loyalty of India’s armed forces, their pristine apolitical record notwithstanding. While distrust between civilians in the MoD and uniformed personnel is not unique to India, what makes this phenomenon distinctive is the reality that a fully cognisant political establishment has allowed it to persist for six decades. The resistance of the Indian Administrative Service to national security reforms, for fear of losing their influence and authority, is well-known. What bears questioning is the role of successive governments in deliberately sustaining and reinforcing a system that places a 100 per cent civilian bureaucracy — with dubious expertise in defence and security domains — in complete control of the nation’s armed forces. Having been anointed with this onerous role, it is astounding to see how the bureaucracy has wriggled out of all accountability for national security lapses and shortcomings, leaving Service Chiefs to carry the can. In the context of defence procurement, the culpability for India’s shameful distinction, of being the world’s largest importer of arms, rests on two departments of MoD — defence production and defence research (or DRDO). 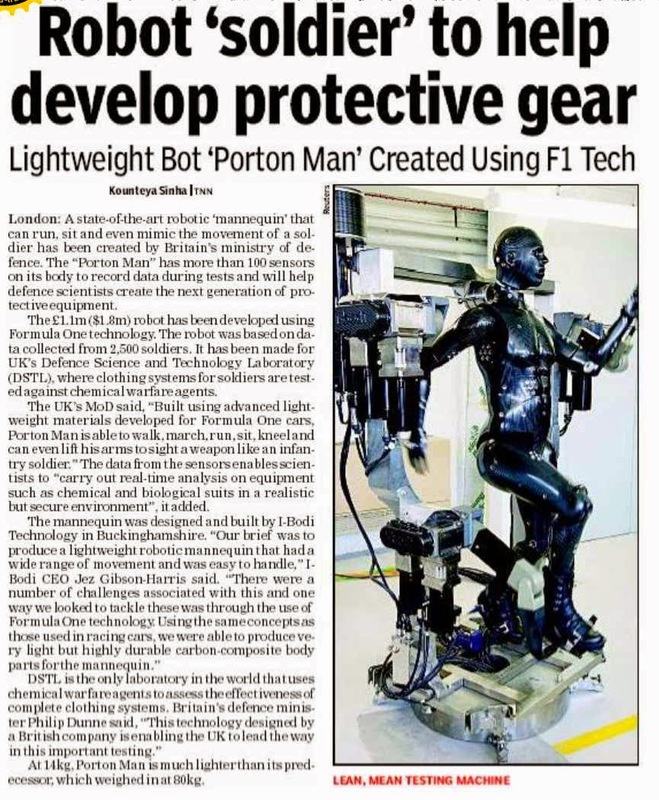 Such is the laissez faire spirit of MoD that the DRDO considers itself free to pursue R&D projects without adequate consultation with the military. The head of this organisation is virtually an “R&D Czar” empowered to raise, scrutinise and approve his own proposals. He is not accountable either to the military or to MoD for overstated claims, time/cost overruns and performance-shortfalls that have perpetually bedevilled DRDO projects and left the armed forces at the mercy of foreign military-industrial complexes. Finally, note needs to be taken of the state of internal health of our armed forces. Certain events, of the recent past, that include misdemeanours at senior ranks, episodes of mass indiscipline and occurrence of serial mishaps, have created misgivings in the public mind about the institutional integrity of the armed forces. The spectrum of concern extends from quality and quantity of officer-intake, to ethical and professional standards of the officer-corps, and from the material state of systems and hardware to the standard of maintenance and safety practices being followed. Admission of shortcomings goes against the grain of human nature, and men in uniform are no exception. However, the country’s security situation, external and internal, is grim and reminiscent, in many ways, of 1962. It is, therefore, imperative that a wide-ranging, critical review of the state of our armed forces be undertaken lest we validate George Santayana’s imprecation that “those who forget history are condemned to re-live the past”. Since there is total unconcern in the political establishment, the military must conduct urgent introspection and initiate in-house remedial measures. Although the pre-election political rhetoric contains hardly any serious reference to security issues, one is tempted to draw attention to Prussian strategist Carl von Clausewitz’s prescription for a good Minister of War: “What is needed in the post is intellect and strength of character; the minister can always get the necessary military information and advice.” He adds, for good measure, “…a certain grasp of military affairs is vital for those in charge of policy”. One hopes this advice may come in handy, post election 2014. India’s 13.1-lakh strong armed forces may be waiting for the new government in May to sign key defence deals, but the defence ministry under the present UPA regime seems to be working to make that difficult. At least three of the five major deals—cumulatively worth over `1.2 lakh crore—that are almost ready and waiting to be signed have been pushed into controversies. The defence ministry under A K Antony has raised red flags and ordered inquiries into these deals, which can raise a political stink whenever these are signed. The latest to come under the scanner is the Indian Air Force’s bid to buy six European Airbus-330 MRTT midair refuellers, said to be worth `7,500 crore. The deal was ready to be signed after India had selected the Airbus platform against the Russian Ilyushin-78s tankers in the early part of 2013. But now, after a member of parliament wrote to the Defence Minister complaining that the Airbus is facing a Central Bureau of Investigation probe in a nearly three-decade-old case in a civil aviation deal, Antony has ordered the procurement file for the Airbus-330 MRTT to be sent to the law ministry for an opinion, say officials. This is the second time that the midair refueller tender faces rough weather. In 2010, the govern- ment had cancelled a 2006 tender, where Airbus had again outwitted Ilyushin. The tender was scrapped after the finance ministry raised questions over the “competititiveness” of the bidding process and the “reasonableness” of the price quoted by Airbus for the planes. In the case of the pro spective `1-lakh-crore tender for 126 Medium Multi Role Combat Aircraft (MMRCA) too, the deal has come under a cloud after Antony said in February this year that “questions have been raised over the offsets proposals” from French firm Dassault Aviation, the winner of the deal. The MMRCA deal was almost ready, but could not be signed by the UPA II government in the 2013-14 fiscal due to funds crunch. Now, this combat planes deal would be signed by the next government soon after it takes over in May. But with Antony raising questions over the offsets proposal from Dassault Aviation, the signing of the deal, whenever it happens, would definitely face questions from whichever party is in opposition at the time. Offsets in defence deals worth over `300 crore would mandate the plough back of at least 30 per cent of the contract amount in the Indian defence, aerospace and internal security industry by the winner of the deal. The offset clause in military deals is an instrument used by governments worldwide to energise their domestic defence industry. In the case of MMRCA, a 50 per cent offset has been fixed for the tender winner Dassault Aviation. But the proposals made by the company for offset implementation had “discrepancies” that are now being looked into, Defence Ministry sources said. The third deal to come under a probe in the last few months is the `8,000-crore tender for 197 Light Utility Helicopters (LUH) in which the European Airbus Helicopters’ AS550C3 Fennec is the lowest bidder against Russia’s Kamov Ka-226T. Just ahead of a government decision on signing the deal, the Italian probe in the `3,727-crore VIP helicopters deal led to findings that the Italian firm Agusta Westland, which was one of the competitors in the Indian LUH tender before being ousted, was asked to pay a bribe of `25 crore by a serving Indian Army Brigadier for a favourable evaluation during flight trials. After the information on the Brigadier was out in the middle of 2013, Army chief General Bikram Singh sought a CBI probe into the LUH tender process. Antony has now entrusted the case for investigation to the CBI. However, two deals involving the American aerospace firm Boeing that are waiting to be signed have managed to stay out of trouble so far. The two deals are for 15 Heavy lift helicopters and 22 attack helicopters for which Boeing's Chinook and Apache respectively have been chosen by India. The two deals are worth `5,000 crore and `7,000 crore respectively. Field Marshal Sam Manekshaw's career was almost written off as a major general after he rebuffed Defence Minister V.K. Krishna Menon's attempt to rope him in a bid to isolate the then Indian Army Chief, General K.S. Thimayya, with whom the Defence Minister openly had differences. A new biography on Manekshaw by his long-serving military aide, Brigadier (Retd) Behram Panthaki and his wife Zenobia, brings out graphically how Manekshaw refused to be disloyal to his chief, and stood up to Menon, who then tried to fix him on frivolous grounds. Titled Field Marshal Sam Manekshaw, The Man and His Times, the biography also discloses how a furious Sardar Patel hustled a reluctant Jawaharlal Nehru into sending the Army to Kashmir and saved the valley from Pakistani raiders in 1947. Nehru, according to this version, wanted to consult with the UN before sending in troops, even after the Maharaja of Kashmir had signed the Instrument of Accession to India. Menon, widely considered responsible for pushing India to its military defeat at the hands of China in 1962, had sought to undermine General Thimayya, after he cautioned the Nehru government against the Menon line of military adventurism against China without adequate preparation. Thimayya offered to resign, but was persuaded by Nehru to stay on. But this did not deter Menon from attempting to subvert Thimayya. The Manekshaw biography paints a grim picture of the Defence Minister trying to create divisions within the Army in the run up to the 1962 War, and even canvassing directly with generals against the Army Chief. In a first, detailed account of the sparring between Menon and Manekshaw, then a major general commanding 26 Division on the Ceasefire Line in the Jammu region, the biographers suggest that Menon sought to probe Manekshaw during a visit to his formation by seeking his opinion on the then Army Chief. "Mr Minister, I am not allowed to think about him. He is my Chief. Tomorrow, you will be asking my (subordinate) brigadiers and colonels what they think of me. It's the surest way to ruin the discipline of the Army. 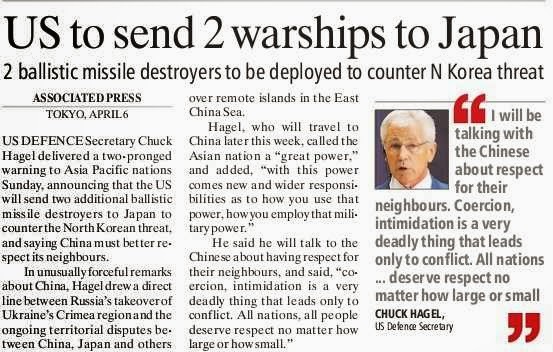 Don't do it in future," responded Manekshaw. Menon flew into a rage and told Manekshaw to "abandon his British ways of thinking", and declared that "I can get rid of Thimayya if I want to!" Undeterred, Manekshaw acknowledged that the Defence Minister could indeed sack the Chief, but that would still not shake his resolve not to comment on the next appointee as well. Manekshaw, whose centenary was observed at a low-key function at Delhi Cantonment on 3 April, also refused to carry out Menon's orders to use soldiers as labourers for constructing deficit accommodation. He insisted that soldiers under his command would only train to fight the enemy and not be used as cheap labour. A scorned Menon turned hostile to Manekshaw, and teamed up with the then Major General B.M. Kaul, to fix him by cooking up evidence to back up frivolous charges. A court of inquiry was ordered against Manekshaw on allegations of being an "unabashed Anglophile", too Western and, by implication, anti-Indian, of restoring and putting up in his office portraits of Robert Clive and Warren Hastings, and insulting Shivaji by saying (allegedly) that the painting of Shivaji riding a stallion was misleading because Shivaji only rode taattoos (ponies). In a foreword to the biography, Manekshaw's contemporary, Lt General S.K. Sinha recounts the sordid attempts by the Menon-Kaul duo to cook up evidence against Manekshaw. Sinha was then, briefly, at the Defence Services Staff College, Wellington, where Manekshaw was the Commandant. A colonel was sent by Kaul from Army Headquarters to get instructors at the Staff College to depose against Manekshaw. This colonel was staying not at an Army mess but, strangely, at a hotel in Coonoor. Sinha too was summoned to this hotel. "When I entered the colonel's room, I found two Army instructors from the Staff College briefing the Colonel and insinuating that Sam had been indulging in 'anti-national' activities....The Colonel asked me to give similar evidence but I refused since I was not witness to any anti-national activity by Sam. The colonel was outraged and threatened to call General Kaul... I walked out of the hotel," recounts Sinha. The charges were dismissed by a court of inquiry by the Western Army Commander, Lt General Daulet Singh, but Menon did not relent in his effort to get Manekshaw dismissed. He wrote a letter of severe displeasure and had it put on Manekshaw's service record. Kaul comes out as an inept General jealous of Manekshaw, who was a threat to his aspiration to become Army Chief. Manekshaw's career survived this vicious assault after both Krishna Menon and Kaul met their nemesis in the 1962 War. The biography also has a revealing account of Nehru's indecision on Kashmir, even as Pakistani raiders were within 7 km of the Srinagar airport on 26 October 1947, and Sardar Patel prevailing upon Nehru. Manekshaw, then a Lt Colonel in the Directorate of Military Operations, presented an assessment to the Defence Committee of the Cabinet that Kashmir would be lost for good if troops were not flown immediately. "Nehru hesitated (even after the Maharaja of Kashmir acceded to India). He was concerned about the world opinion and talked about consulting the UN until an impatient Sardar wrested the initiative from him. "Jawahar, do you want Kashmir or do you want to give it away?" "Of course, I want Kashmir," was Nehru's indignant response. The Sardar turned to Sam and said, "You have your marching orders". "At 11 am from Delhi's Safdarjung airport with six IAF and fifty Dakotas requisitioned a few days earlier from private airlines. A total of 800 sorties were flown for a fortnight. By 16 November the raiders had been repulsed from the valley and Srinagar and the airport were secured although engagement with infiltrators in the rest of Kashmir and along the border continued for another 14 months," the book states.